This entry was posted in Uncategorized and tagged Consumer Confidence on December 31, 2013 by Ted Kavadas. 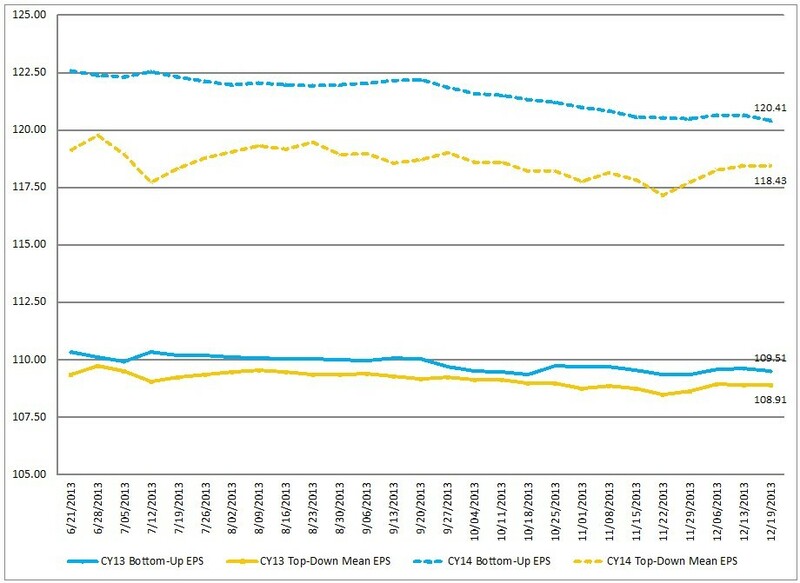 Below are three long-term charts, from Doug Short’s blog post of December 27, 2013 titled “ECRI Recession Watch: Weekly Update.” These charts are on a weekly basis through the December 27 release, indicating data through December 20, 2013. 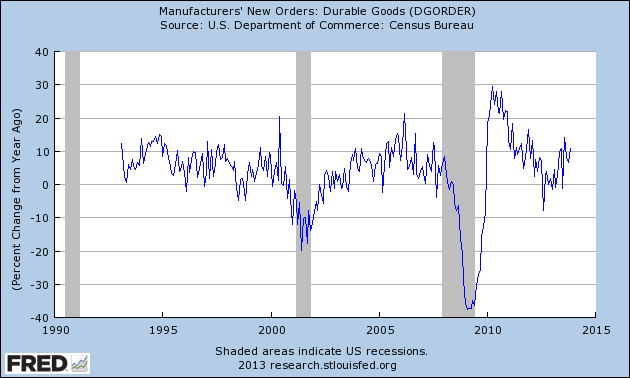 This entry was posted in Economic Forecasts and tagged ECRI on December 27, 2013 by Ted Kavadas. This entry was posted in Economic Forecasts and tagged Economic Forecasts, economic indicators, STLFSI on December 26, 2013 by Ted Kavadas. 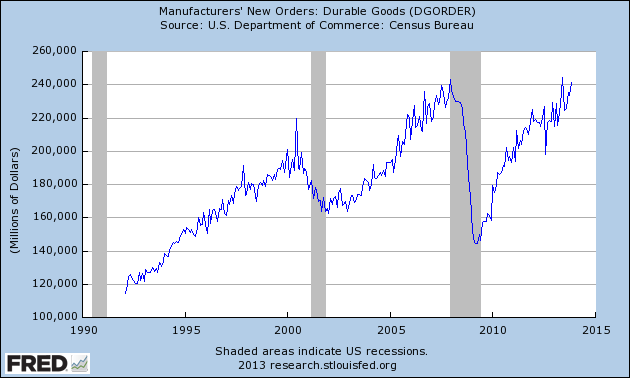 This entry was posted in Uncategorized and tagged economic indicators on December 26, 2013 by Ted Kavadas. As of 12/20/13 (incorporating data through 12/13/13) the WLI was at 130.9 and the WLI, Gr. was at 2.1%. 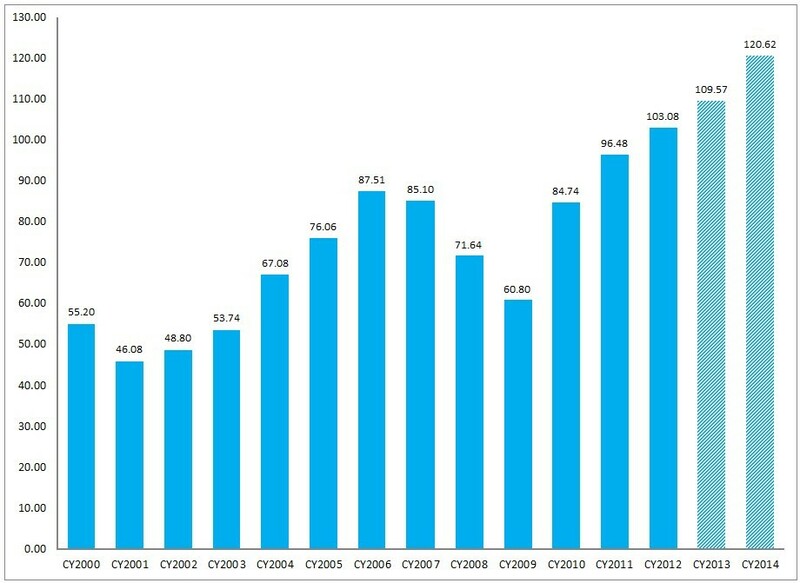 As per the December 19 press release, the LEI was at 98.3 and the CEI was at 107.2 in November. 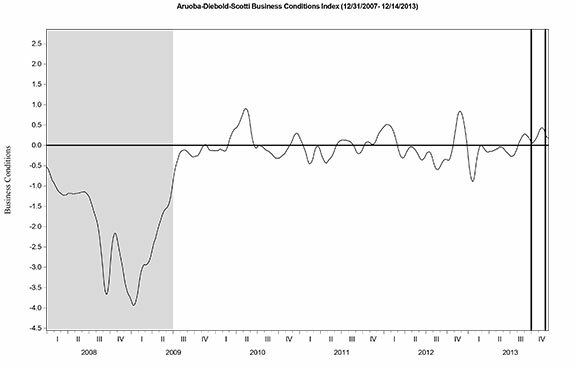 This entry was posted in Economic Forecasts and tagged ADS Index, Aruoba-Diebold-Scotti Business Conditions Index, Chicago Fed National Activity Index, Conference Board CEI, Conference Board LEI, economic forecasting, economic indicators, ECRI on December 23, 2013 by Ted Kavadas. On Wednesday, December 18, 2013 Ben Bernanke gave his scheduled press conference. Below are Ben Bernanke’s comments I found most notable – although I don’t necessarily agree with them – in the order they appear in the transcript. These comments are excerpted from the “Transcript of Chairman Bernanke’s Press Conference“(preliminary)(pdf) of December 18, 2013, with the accompanying “FOMC Statement” and “Economic Projections of Federal Reserve Board Members and Federal Reserve Bank Presidents, December 2013“ (pdf). Inflation has been running below the Committee’s longer-run objective of 2 percent. The Committee recognizes that inflation persistently below its objective could pose risks to economic performance and is monitoring inflation developments carefully for evidence that inflation will move back toward its objective over time. This outlook is broadly consistent with the individual economic projections submitted in conjunction with this meeting by the 17 FOMC participants–5 Board members and 12 Reserve Bank presidents. As always, each participant’s projections are conditioned on his or her own view of appropriate monetary policy. FOMC participants generally expect economic growth to pick up somewhat over the next few years. Their projections for increases in gross domestic product have a central tendency of 2.2 to 2.3 percent for 2013, rising to between 2.8 and 3.2 percent for next year, with similar growth estimates for 2015 and 2016. Participants see the unemployment rate, which was 7 percent in November, as continuing to decline. The central tendency of the projections has the unemployment rate falling to between 6.3 and 6.6 percent in the fourth quarter of 2014 and then to between 5.3 and 5.8 percent by the final quarter of 2016. Meanwhile, FOMC participants continue to see inflation running below our 2 percent objective for a time but moving gradually back toward 2 percent as the economy expands. The central tendency of their inflation projections for 2013 is 0.9 to 1.0 percent, rising to 1.4 to 1.6 percent for next year and to between 1.7 and 2.0 percent in 2016. STEVE LIESMAN. Steve Liesman, CNBC. Mr. Chairman, thank you. When you say similar moderate steps going forward, is 10 billion an increment that people should anticipate? And is equal amounts of mortgage-backed securities and Treasuries also what one should anticipate? Finally, when you say well passed the unemployment rate of 6-1/2 percent, why not pick a number? Why say well passed? Thank you. CHAIRMAN BERNANKE. Sure. On the first issue of 10 billion, again, we say we could take further modest steps subsequently so that would be the general range. But again, I want to emphasize that we are going to be data dependent. We could stop purchases, if the economy disappoints. We could pick them up somewhat, if the economy is stronger. In terms of MBS versus Treasuries, we discussed that issue. I think that the general sense of the Committee was that equal reductions are approximately equal reductions was the simpler way to do this. It obviously doesn’t make a great deal of difference in the end to how much we hold. So that was going to be our strategy. On the issue, another number, the unemployment rate-let’s talk first about the labor market condition. The unemployment rate is a good indicator of labor market. It’s probably the best single indicator that we have. And so we were comfortable setting a 6.5 percent unemployment rate as the point at which we would begin to look at a more broad set of labor market indicators. However, precisely because we don’t want to look just at the unemployment rate, we want to–once we get to six and a half, we want to look at hiring, quits, vacancies, participation, long-term unemployment, et cetera, wages. We couldn’t put it in terms of another unemployment-rate level specifically. So, I expect there would be some time past the 6-1/2 percent before all of the other variables that we’re looking at will line up in a way that will give us confidence that the labor market is strong enough to withstand the beginning of increases in rates. The SEP, the Survey of Economic Projections, which were distributed, obviously that’s individual assessments and not the Committee’s collective view. But nevertheless, it gives you some sense of current expectations about the length of time. The SEP shows that the 6.5 percent is expected by a large number of people to be reached about the end of next year, end of 2014. And then the first rate increases according to the so-called “Dot’s Chart” take place near the end of 2015. So that’s the order of the magnitude I think that people are currently expecting, but again I want to emphasize that it will depend on our–being persuaded that over across the broad range of indicators, the labor market is sufficiently strong that we could begin to withdraw accommodation. 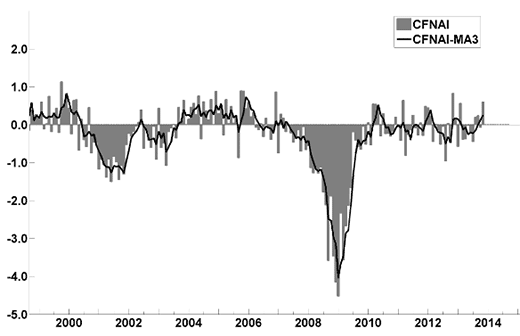 inflation forecasts never get back to two percent in the time horizon that you cover here at 2016. Given that, why should we believe the Fed has a symmetric inflation target and in particular, why should we believe you’re following an optimal policy, optimal-controlled policy as you said in the past given that that would imply inflation going if it’s above target at some point? Thank you. CHAIRMAN BERNANKE. Well again, these are individual estimates, lot, big, standard errors implicitly around them and so on. We do think that inflation will gradually move back to 2 percent and we allow for the possibility as you know in our guidance that it could go as high as 2-1/2 percent. Even though inflation has been quite low in 2013, let me give you the case for why inflation might rise. First, there are some special factors such as health care costs and some other things that have been unusually low and might be reversed. Secondly, if you look at the fundamentals for inflation, including inflation expectations be it measured by financial markets or surveys; if you look at growth which we now anticipate we’ll be picking up both in the US and internationally; if you look at wages which have been growing at 2 percent and a little bit higher according to many indicators. All these things suggest that inflation will gradually pick up. But what I tried to emphasize in my opening remarks which is clear in our statement is that we take this very seriously. It’s not easy to–inflation cannot be picked up and move where you want it. It takes–it requires obviously some luck and some good policy. But we are very committed to making sure that inflation does not stay too low and we are continuing to monitor that very carefully and to take whatever actions necessary to achieve that. ROBIN HARDING. And then optimal control. CHAIRMAN BERNANKE. With even under optimal control, it would take a while for inflation. Inflation is quite–can be quite inertial, can take by the time to move. And the responsiveness of inflation to increasing economic activity is quite low. So, and it particularly given that environment where we have falling oil prices and other factors that are contributing downward forces on inflation. It’s difficult to get inflation to move–move quickly to target but we are again committed to doing what’s necessary to get inflation back to target over the next couple of years. CRAIG TORRES. Craig Torres from Bloomberg News. There’s been a great deal of discussion in your profession about the potency of policy at the zero boundary. And to kind of bounce off Robin, it’s very striking that inflation is falling while QE3 has been in place, and the economy continues to undershoot the FOMC’s forecast. So, I guess the simple question is, are you giving up, you know, I mean, have you reached the limit of your policy tools and is there nothing more you can do? The economy is still running way below the trend line that existed before the financial crisis. CHAIRMAN BERNANKE. Well, everything depends on what benchmark you compare it to, as you know. I said last year that monetary policy was not a panacea. It couldn’t solve all our problems. And in particular, it can’t do anything about a slowing in potential growth which appears to happen at least to some extent. It can’t do much or anything about fiscal policy which is working in quite the opposite direction. So, given those things, I think the outcomes we had are perhaps not as bad as you would–might think. In particular, as I’ve mentioned many times, the Congressional Budget Office assessed the fiscal drag in 2013 has been by one and a half percentage points of growth. We’re looking like we’re going to get in the low two’s actual growth, add those numbers together, it’s kind of a counterfactual. It says the monetary policy appears to have succeeded in offsetting a good bid of that fiscal drag which we were not at all sure that we could accomplish. So, we’re certainly not giving up. We intend to maintain a highly accommodative policy. Nothing that we did today was intended to reduce the combination. We’re still going to buying assets at a high rate and increasing and holding–increasing our balance sheet and holding on to those assets and our guidance today, we strengthen our guidance to make clear that we expect to keep rates low well beyond the point of unemployment rate, six and a half percent. GREG IP. Greg Ip of the Economist. I have a narrow question and a related broader question. The narrow question is, did the changeover in leadership play any role in the decision on when to begin tapering, i.e. at this meeting? For example, did you have a preference all else equal to get it started before you left? The related broader question is you are a historian of monetary policy. What do you think future historians of monetary policy will have to say about your eight years at the Federal Reserve helm? CHAIRMAN BERNANKE. The answer to the first question is no. The answer to the second question is I’ll be interested to see. I hope I live long enough to read the textbooks. The-what we’ve showed–there’ve been two big changes; at least more than two, but two that I would cite at the Fed in the last few years, of course, the result in many ways of the crisis. The first is that Federal Reserve has rediscovered its roots, in the sense that the Fed was created to stabilize the financial system in times of panic. And we did that and we used tools that were analogous in spirit to what the central banks have done for many hundreds of years, but of course, adapted to a modern financial system. The other thing that was unique about it–maybe not completely unique, but largely unique about this period was that we were trying to help the economy recover from a deep recession at a time when interest rates were almost or essentially zero. And that required us to use other methods, most prominently forward guidance and asset purchases, neither of which is entirely new. But clearly this is–unless you put aside the depression, where monetary policy was, on the whole, pretty passive–this is the first–one of the first examples at least of aggressive monetary policy taking place in a near zero interest rate environment. Now we’re seeing, of course, Japan and UK and other countries also taking similar types of approaches. And I think that will be an issue, an area that monetary historians will be interested in exploring, as well as monetary theorists and empirical studies. BINYAMIN APPELBAUM. Some members of your staff published a paper earlier this fall arguing that in times of high unemployment–and particularly when some of that unemployment is calcifying into disengagement–there’s an argument from monetary policy to be even more aggressive. And yet you are now announcing that you’ll do less rather than more. The Fed has done twice before and both times has regretted the decision. Can you talk about why you are not erring on the side of doing more? CHAIRMAN BERNANKE. Well, again, we’re not doing less. We’ll see how accommodation shapes up. But while we are slowing asset purchases a bit, again we expect total balance sheet to be quite large and maintained for–at a large level for a long time. And we expect to keep rates low for a very long time. We’re providing a great deal of accommodation to the economy. I agree with your observation and the observation of the paper that you cited that there is a case we’re being particularly aggressive, and I think we have been aggressive to try to keep the economy growing, and we are seeing progress in the labor market. So I would dispute the idea that we’re not providing a lot of accommodation to the economy. WYATT ANDREW. Mr. Chairman, thank you. Wyatt Andrews at CBS. Given the billions of dollars that the Fed has put into the economy over the years, do you see a leading reason why the economy has not created more jobs? CHAIRMAN BERNANKE. So, we’ve been in a–it’s been about a little over four years now since the recovery began, four and a half years. It’s been a slow recovery. There are a number of reasons for that, it’s–of course, that’s something for econometricians and historians to grapple with. But there have been a number of factors which have contributed to slower growth. And they include, for example, the observation of financial crises tend to disrupt the economy, may affect innovation. New products, new firms. We had a big housing bust, and so, the construction sector, of course, has been quite depressed for awhile. We’ve had continuing financial disturbances in Europe and elsewhere. We’ve had a very tight, on the whole–except for in 2009–we had very tight fiscal policy. People don’t appreciate how tight fiscal policy has been. At this stage in the last recession, which was a much milder recession, state, local, and federal governments had hired 400,000 additional workers from the trough of the recession. At the same point in this recovery, the change in state, local, and federal government workers is minus 600,000. So there’s about a million workers difference in how many people are–been employed at all levels of government. So, fiscal policy has been tight, contractionary, so there have been a lot of headwinds. All that being said, we have been disappointed in the pace of growth, and we don’t fully understand why. Some of it may be a slower pace of underlying potential, at least temporarily. Productively has been disappointing. It may be that there’s been some bad luck, for example, the effects of the European crisis and the like. But compared to other advanced industrial countries–Europe, UK, Japan–compared to other countries and vast industrial countries recovering from financial crises, the U.S. recovery has actually been better than most. It’s not been good, it’s not been satisfactory. Obviously, we still have a labor market where it’s not easy for people to find work. A lot of young people can’t get the experience and entree into the labor market. But, I think, given all of the things that we faced, it’s perhaps–at least in retrospect–not shocking that the recovery has been somewhat tepid. PETER COOK. Peter Cook of Bloomberg Television. Mr. Chairman, first of all, thank you for holding these news conferences. I hope you encourage your successor to have even more of them. One thing I know you’re going to miss is traveling to Capitol Hill to testify, and one thing that’s going to be happening next year, according to the Chairman of the House Financial Services Committee, is a full review of the Federal Reserve–even the Federal Reserve Act, the structure of the Fed, the mission of the Fed, and the mandate of the Fed. And I wanted to see if you might be willing to impart some final words of wisdom to members of Congress as they consider possible legislative changes. What, if anything, could they do to the structure of the Federal Reserve, the mandate of the Federal Reserve, the dual mandate, that might help Fed policy makers in the future? Do you think the dual mandate still is merited? And just a final question for you, sir, as you get set to leave and perhaps your last news conference here–you talked a little bit about your frustrations, the headwinds that you faced through the course of your eight years. Is there a decision–with the benefit of hindsight–that you would do differently, one change perhaps in a decision-making process that you’ve made, your fellow colleagues have made here, that you think would have made a difference materially over the last eight years? CHAIRMAN BERNANKE. Well, on the centennial review, let me just say first that one of the things that I’m proud of and I’ve tried to accomplish over the past eight years is to increase the transparency of the Fed and to increase the accountability of the Fed. You mentioned those trips to Capitol Hill. I’ve testified many times, as have a number of my colleagues. There is this notion of the Fed is not audited, or it has all kinds of secret books–all these things. As you well know, we have complete openness to the General Accountability Office, the GAO–Government Accountability Office. We have an IG, Inspector General, of our own. We have our private accounting firm that does all the books as well under very tough standards. We publish regular reports in all aspects of our operations. So we’re very open, and we are by all means willing to work with Congress to see if there’s anything they think might be done better or in a more effective way. So we’re open to doing that. I hope that those reviewing the central bank will, of course, recognize that central banking is an old activity. The 17th century is when the Swedish Riksbank and the Bank of England began operation, so we know a lot about central banking. There are a lot of experts on central banking, a lot of experts on monetary policy. Every major country has a central bank. So we’re not starting from scratch. I mean, there’s a lot of people with a lot of expertise on this, and I hope that as we talk about these issues that we are bringing in serious people who understand these issues and who can make good suggestions. Now, there are a range of different mandates around the world. There are some single mandates. There are some dual mandates, et cetera. It’s our sense that the dual mandate has served us well here, in particular that the Fed has been able at times to speed the recovery from recession and help put people back to work more quickly. Of course, we can’t do anything about long-run employment opportunities, but we can help the economy recovery more quickly. So I think that that’s valuable. I would note, by the way, that at the current moment, it doesn’t really matter whether we have one mandate or two, because we’re below our inflation target and we-unemployment is above where we’d like it to be. So both sides of our mandate are pointing exactly in the same direction, which is to provide strong accommodation to the economy to help it recover. Looking in retrospect I, you know, this–that’s a very hard question. Every decision you make, of course, is done in real time with deficient information and whatever you know at the time and whatever the experts are telling you about any particular issue. Obviously, we were slow to recognize the crisis. I was slow to recognize the crisis. In retrospect, it was a traditional classic crisis, but in a very, very different guise: different types of financial instruments, different types of institutions, which made it, for a historian like me, more difficult to see. Whether or not we could have prevented or done more about it, that’s another question. You know, by the time I became Chairman, it was already 2006, and house prices were already declining. Most of the mortgages had been made, but obviously, it would have been good to have recognized that earlier and try to take a more preventive action. That being said, we’ve done everything we can think of essentially to strengthen the Fed’s ability to monitor the financial markets, to take actions to stabilize the economy in the financial system. So I think going forward, we’re much better prepared for–to deal with these kinds of events than we were when I became Chairman in 2006. STEVE BECKNER. Steve Beckner of MNI. Mr. Chairman, it’s been a pleasure covering you. One of the factors that your policy statement says will be considered in assessing the future pace of asset purchases is the cost and efficacy of those purchases. To what extent has the–or you might say cost and benefits–to what extent has that calculation already changed? To what extent that did that affect today’s decision? And going forward, looking on the cost side, somebody else mentioned bubbles. Not just bubbles but to what extent will, you know, the whole consideration of threats to financial stability come into play as well as the potential for losses on the Fed’s own portfolio? CHAIRMAN BERNANKE. So I will answer your question and try and help maybe do a better job on Binya’s question as well. We do think again of the asset purchases as a secondary tool behind interest rate policy, and we do think that the cost-benefit ratio, particularly as the assets on the balance sheet get large, that it moves in a way that’s less favorable. The cost involved include, you know, managing the exit from that. 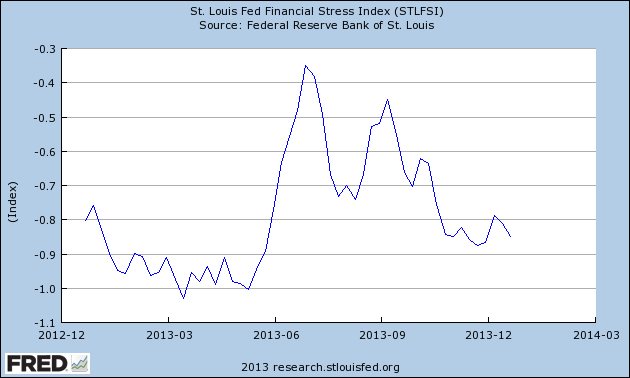 The possible–it’s very unlikely that the Fed will have losses in any comprehensive sense. We’ve already put $350 billion of profits back to the Treasury since 2009, which is about as much as we delivered to the Treasury between 1990 and 2007 combined. So, over any period of time, clearly the Fed is actually making a good bit of money for the taxpayer and for the government, but it could be that if interest rates rise quickly, for example, that we would be in a situation of not giving remittances to the Treasury for a couple of years, and that would create problems no doubt for the Fed in terms of Congressional response. There are issues of how well we understand and can manage the effects of asset purchases. I think, for example, that an important difference between asset purchases and interest rate policy is that asset purchases work by affecting what is called a term premium, which is essentially the additional part of the interest rate which investors require as compensation for holding longer-term securities. We just don’t understand very well, and I say we, I mean the economic profession, don’t understand very well what moves the term premium. And so, we sa-last summer, we saw a very big jump in the term premium that was very destabilizing and created a lot of stress in financial markets. So there are a number of reasons why asset purchases, while effective, while I think they have been important, are less attractive tools than traditional interest rate policy, and that’s the reason why we have relied primarily on interest rates, but used asset purchases as a supplement when we’ve needed it to keep forward progress. I think that, you know, obviously there are some financial stability issues involved there. We look at the possibility that asset purchases have led to bubbly pricing in certain markets or in excessive leverage or excessive risk taking. We don’t think that that’s happened to an extent, which is a danger to the system, except other than that when those positions unwind, like we saw over the summer, they can create some bumpiness in interest rate markets in particular. Our general philosophy on financial stability issues is where we can, that we try to address it first and foremost by making sure that the banking system and the financial system are as strong as possible. If banks have a lot of capital, they can withstand losses, for example. And by using whatever other tools we have to try to avoid bubbles or other kinds of financial risks. 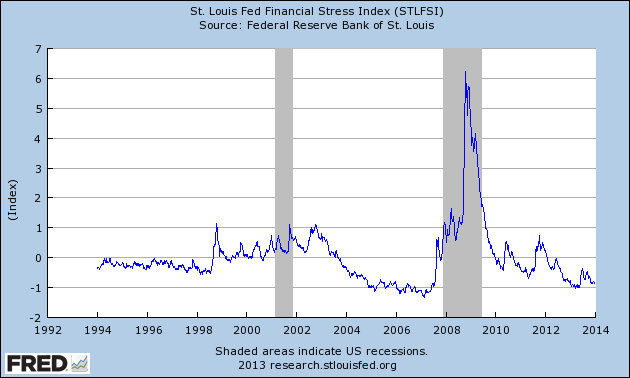 That being said, I don’t think that you can completely ignore financial stability concerns in monetary policy, because we can’t control them perfectly, and there may be situations when financial instability has implications for our mandate, which is jobs and inflation, which we saw of course in the Great Recession. So it’s a very complex issue. I think it would be many years before central banks have completely worked out exactly how best to deal with financial instability questions. Certainly, the first line of defense for us is regulatory and other types of measures, but we do have to pay some attention to that. I would say at this point though that the asset purchases program, the last one, is well on its way to meeting our economic objective, and I am very pleased that we’re able to over time wind down this program, slowing the pace of purchases on current plans, because we reached our objective, rather than because the costs or efficacy issues became important. So I think that in this case that’s not a concern at this juncture with respect to this program. ANNALYN KURTZ. Annalyn Kurtz with CNN. I recall in Jackson Hole last year, you cited a study that said the first $2 trillion on asset purchases had boost the GDP by about three percent and increased private sector employment by two million jobs. Now, your balance sheet is near in $4 trillion, and I’m wondering: Do you feel the third round of asset purchases packed as much bang for your buck? And do you still think the first study offered a reasonable estimate? CHAIRMAN BERNANKE. Well, it’s very hard to know–in terms of the study, it’s very hard to know. It’s imprecise science try to measure these effects. You have to obviously ask yourself, you know, what would have happened in the absence of the policy? I think that study, I think was a very interesting study, but it was on the upper end of the estimates that people have gotten in a variety of studies looking at the effects of the asset purchases. That being said, I’m pretty comfortable with the idea that this program did in fact create jobs. I cited some figures. To repeat one of them, the Blue Chip forecasts for unemployment in this current quarter made before we begin our program were on the order 7.8 percent, and that was before the fiscal cliff deal, which even–created even more fiscal headwinds for the economy. And of course, we’re now at 7 percent. I’m not saying that the asset purchases made all that difference, but it made some of the difference, and I think it has helped create jobs. And you can see how it works, I mean the asset purchases brought down long-term interest rates, brought down mortgage rates, brought down corporate bond deals, brought down car loan interest rates, and we’ve seen the response in those areas as the economy has done better. Moreover again, this is been done in the face of very tight, unusually tight fiscal policy for a recovery period. So I do think it’s been effective, but the precise size of the impact is something I think that we can very reasonably disagree about, and that work will continue on. As I said before, the uncertainty about the impact and the uncertainty about the effects of ending programs and so on is one of the reasons why we have treated this as a supplementary tool rather than as a primary tool. MURREY JACOBSON. Hi. Murrey Jacobson with The NewsHour. On the question of longer-term unemployment and the drop in labor force participation, how much do you see that as the result of structural changes going on in the economy at this point? And to what extent do you think government can help alleviate that in this environment? CHAIRMAN BERNANKE. I think a lot of the declines in the participation rate are in fact demographic or structural reflecting sociological trends. Many of the changes that we’re seeing now, we were also seeing to some degree even before the crisis, and we have a number of staffers here at the Fed who have studied participation rates and the like. So I think a lot of the unemployment decline that we’ve seen, contrary to sometimes what you hear, I think a lot of it really does come from jobs as opposed to declining participation. That being said, there certainly is a portion of the decline in participation, which is related to people dropping out of the labor force, because they are discouraged, because their skills have become obsolete, because they’ve lost attachment to the labor force and so on. The Fed can address that to some extent if–you know, if we’re able to get the economy closer to full employment, then some people who are discouraged or who have been unemployed for a long time might find that they have opportunities to rejoin the labor market. But I think fundamentally that training our workforce to fit the needs of 21st-century industry in the world that we have today is the job of both the private educational sector and the government educational sector. We have many strengths in our educational sector including outstanding universities but we have a lot of weaknesses as you know. There are many, many factors that affect participation, employment, wages, and so on, but the one I think that we can most directly affect is the skill level of our workforce. And that doesn’t mean everybody has to go to get a PhD. People have different needs, different interests. But that I think is one of the biggest challenges that our society faces, and if we don’t address it, then we’re going to see a larger and larger number of people who are either unemployed, underemployed or working at very low wages, which obviously is not something we want to see. This entry was posted in Ben Bernanke and tagged Ben Bernanke on December 23, 2013 by Ted Kavadas. With regard to our current economic situation, my thoughts can best be described/summarized by the posts found under the 31 “Building Financial Danger” posts. This entry was posted in Uncategorized and tagged current economic situation on December 23, 2013 by Ted Kavadas. This entry was posted in Investor, Stock Market and tagged S&P500, S&P500 Earnings, Stock Market on December 23, 2013 by Ted Kavadas.